dimensions 24 by 11 ½ by 13 ½ inches. Very interesting about this speaker is the historical context, which became Acoustic Research´s downfall. The AR-8 entered the market in 1973 for as little as $129/$119. AR´s advertisement states that the speaker is made to handle “higher volumes needed for rock music”, but it is well capable of satisfying listeners of any other music style. The AR-8, like most other Acoustic Research speakers of the time, is an acoustic suspension speaker system with a woofer and tweeter that can handle particularly high power levels. It resembles previous AR systems – the typical two-cubic-foot sealed walnut cabinet fronted by a removable grill cloth. The speaker has a 10-inch woofer and a 1 ½ inch dome-center tweeter. It is very similar to its smaller brother, the AR-7 speaker (check out our AR-7 speaker review), as the AR-8 contains the same tweeter and a slightly bigger woofer (AR-7: 8 inch) in a slightly bigger enclosure. Why was the AR-8 a failure? History Lesson! During the 1960ies and 70ies, the main target group for high fidelity sound equipment was mid-aged men. 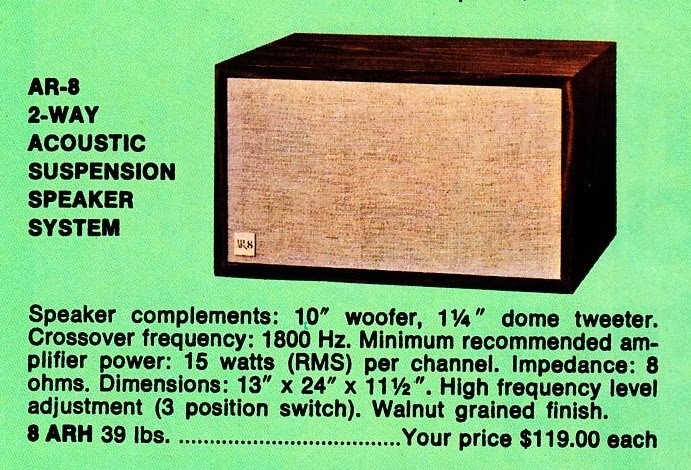 However, in the mid 70ies, a new customer group entered the market; young people, looking for modern, affordable speakers to listen to loud, modern music. Other brands developed speakers specifically for this new customer group, but AR missed to do so effectively. The quote at the beginning of this article and in particular the AR-8´s main slogan ”The first accurate speaker for rock music” indicate that the Acoustic Research tried to target young consumers. Young college students typically liked the upcoming rock music. This does also explain why the AR-8 has a punchier, 10 inch woofer, instead of the AR-7´s 8 inch woofer. Acoustic Research tried to blend in with the other manufacturers, such as Advent, who experienced great profits with their fresh, modern loudspeakers. The slogan “The first accurate speaker for rock music” shows very well, how Acoustic Research tried to be young and modern on the one hand, but to rest on the own successful history and brand image, which resembled unmet accuracy and advanced technology on the other hand. This did not work out and caused the AR-8 to not meet the market demands. Another reason for the failure might be found within the own product line of Acoustic Research. As mentioned in the paragraph above, the Acoustic Research offered a very similar speaker when it comes to sound quality and performance, the smaller AR-7. The two speakers were targeting a different target group, but had very similar specs, which caused potential customers to choose between the small AR-7 and the bigger AR-8. However, the AR-7 was available for only $75, which was an incredible 35% less expensive. Therefore, the AR-7 became a much bigger success and sold in much bigger numbers. The AR-8 did also enter the market as the last model of the classic AR speaker series, nearly a year later than the AR-7. Frequency division, at 1800 Hz, is handled by an internal network. On the rear panel there´s a recessed section that contains the input terminals (a pair of knurled-nut-and-screw posts that accept stripped leads or leads fitted with spade lugs) marked for polarity, and a three position toggle switch that adjusts the relative level of the highs. The AR-8 is rated for 8 Ohms impedance, minimum recommended amplifier power is 15 watts per channel. In tests at CBS Labs the AR-8´s impedance measured 7 ohms just past the characteristic bass rise and it averaged a very smooth 8 ohms all across the range to beyond 20 kHz. All in all, the AR-8 speaker received good performance marks for a speaker in its price class. The AR-8 in general is of higher efficiency than many previous AR systems (before 1973), but its ultimate power-handling ability is only a bit less. It needs 2.8 watts to produce the standard test output signal of 94 dB. It handles steady-state power inputs of 50 watts before “buzzing” to produce an output of 106db. Middles and highs are well dispersed, with no serious directional effects noticeable until 10 kHz. It is also important to note that it had several successors. The original AR-8 speaker was not too successful, but later models from the mid 1980ies, such as the AR-8B, AR-8Bx and AR-8xi have been. However, those later speakers were 6 ½ inch two-way speakers and substantially different to the original AR-8. Compare the AR-8 specs at the bottom, if you are not sure, which model you are looking for. How about the AR-2X? I really dont think that such a small speaker like the AR-7 can compete with a big speaker like the AR-8? I dont think that its the AR-7's fault that the AR-8 was a failure, more the AR-2X, which is quite similar to the AR-8.